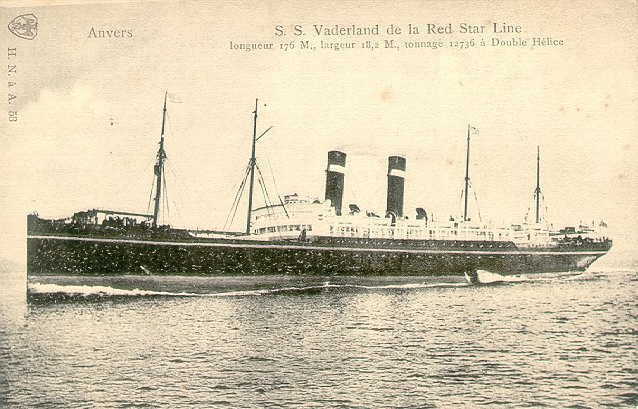 I have a ship manifest for the Vaderland, run by Red Star, departing from Antwerp, Belgium and arriving at New York, New York on November 4, 1904: On line 21 is a Robert Gregorčič fromm Austria and of Slovenian descent. What do these mean? I notice that 505 occurs several times. Could these be passport numbers and country numbers? Could the dates be birthdate of their fathers? The dates are all between 1836 and 1842, suggesting dates for parents of the travellers. Why would these extra dates be collected and only for some passengers? In particular, I'm most interested in the entries on line 21 and 22 for my ancestors whose origins I know very little. Adrian is correct -- as he suggested in the earlier answer, we can find some clues in Marian L. Smith's Guide to Interpreting Passenger List Annotations. In the Glossary of Acronyms and Abbreviations Smith and her co-authors tell us that that 505 stands for Form 505 - Arrival Information and they refer us to the page Markings on the Manifest's Occupation Column. As you saw, most of the other markings of similar type on this page are written in column 6 (the occupation column) -- perhaps in these cases the annotation was made around column 8 because there was more white space on the manifest there. Smith says that immigrants who arrived after June 29, 1906, were required to ask the Bureau of Naturalization for a Certificate of Arrival verifying their arrival date as part of the naturalization process. But in 1926 verification clerks began to record the verification (record check) and certification activity on each passenger list record. This change came about in response to a terrible scandal about fraudulent naturalizations. By noting that a given immigration record had been used to support an individual naturalization, the annotation served in future to prevent anyone else from using that record for another naturalization. 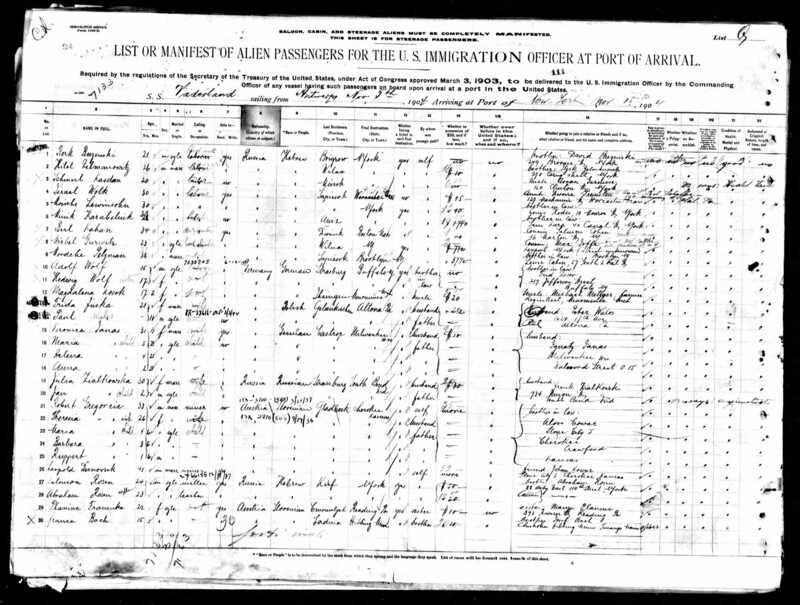 While the annotations may be found on any passenger list, before or after 1926, they will all relate to naturalization activity occurring in 1926 or later (see below). This notation on the lists took place until around 1942/1943, when the passenger lists were microfilmed. Your passengers arrived in 1907, and both dates on your entries are before 1942, so these entries are consistent with the timeframe mentioned on this page. If 505 is the document number, and the dates are the verification dates, are the other two pieces a district number and an application number? The page INS Naturalization District Numbers From 1933 to 1943 can't give us a definitive answer because the boundaries were changing during that time period. But according to the table, District 12 was the territory of the St. Louis, Missouri INS office, covering Southern Illinois, Southeast Iowa, Western Kentucky, and Western Missouri. This is not consistent with the passengers' listed Final Destination of Kansas, but it is in the ballpark -- 1937 is 20 years later than 1907, and there's no guarantee that people would stay in the same area that they planned to go to in 1907. So -- what about the document numbers of 3100 and 2810? I didn't quite get the whole line in the snippet of the Petition, but you can see on the very last line that the person shown arrived on 12 October 1923, and the date has been verified by the Certificate of Arrival. Note that the Certificate of Arrival has a number with a prefix of 11- followed by six digits, and the Petition for Naturalization has a four digit number. The number for the Certificate of Naturalization generally has more digits than four numbers; his wife's certificate number, which is listed on his petition further down the page, is a seven-digit number. 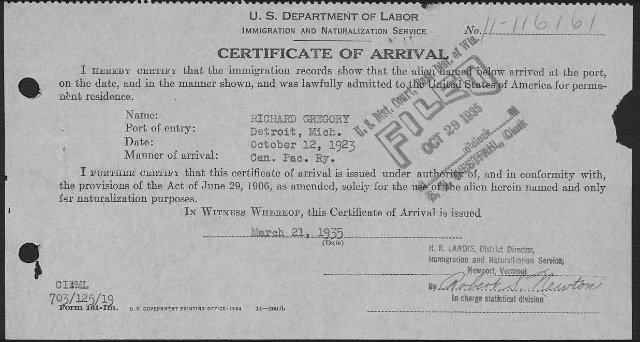 Immigrants could naturalize in local courts as well as Federal ones, so even if you narrowed down where the Gregorčičs were living in the 1936/1937 period, it might take a while to discover where they naturalized by going through the area's court records. The easy way to find out when and where they naturalized is to request an index search from the History and Genealogy program at the USCIS, the modern-day agency that is the successor to the INS. the USCIS will send back a letter detailing what records were found, with advice about how much it will cost to order a copy of the files. They will tell you not just about the Naturalization file, but any files from five different record groups still in the custody of the USCIS. The Genealogy Program Brochure also explains what information you'll need to have in order to request an index search. The USCIS holds live webinars that walk you through the process of requesting an index search, and explains the nature of the different types of records. If you want to do an index search, you may want to do it soon; Judy G. Russell posted recently on her blog The Legal Genealogist that there may be a fee hike coming soon. Do you have any census records for your ancestors? There might be Clues in Census Records that would flesh out the timeline for their naturalization process. Not the answer you're looking for? Browse other questions tagged united-states 20th-century manifest naturalization belgium or ask your own question. What are the meanings of these visa codes? Narrowing down date of immigration from England to USA?